Happy Monday, readers! 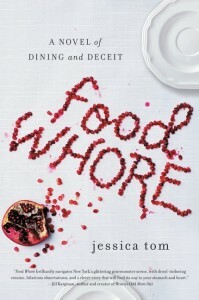 Today I'm a stop on the TLC book tour for Jessica Tom's Food Whore. Tia Monroe loves food and she loves writing about food. So an internship with her favorite food writer, Helen Lansky, would be the perfect thing to get her on the right path as part of her graduate studies. Unfortunately things don't quite go Tia's way. The internship she's awarded is, surprisingly, not her top choice or any of her choices at all. But there's always next year, right? Fate seems to smile on Tia, however, when a famous restaurant critic offers her an opportunity she can't pass up. Said critic has lost his sense of taste and can't let anyone find out. He wants Tia to be his palate and provide feedback he can use for his reviews. In exchange he's promised to give her an in with Helen. And working with the critic means more than just getting into the hottest new restaurants in New York City. In order to look the part, Tia is given free reign of the critic's Bergdorf account and a personal shopper to help her get the right clothes for her new role. Amidst the glitz and glamour of her new secret job, though, Tia soon finds not all is rosy. Seeing her own words in print is great, but seeing those words attributed to another person hurts. And all the secrets Tia's keeping start to greatly affect her personal life too. Food Whore forces readers to consider just how far they'd go to make their dreams come true. I think it's something a lot of people can associate with these days. Let's face it, lots of people's dreams are never realized at all thanks to a whole slew of variables and not getting the right internship can seem like a deal breaker to any college student. Tia's problem is that once she's in, she's in too deep and she keeps her word in not telling anyone! Jessica Tom has a lot in common with her heroine - she's an avid foodie and writer who has worked as a critic and attended Yale. Fortunately the similarities seem to end there - in other words, Tom didn't provide under the table reviews for another critic to write off as their own. But her portrayals of the restaurant/foodie scene in New York City are vibrantly realistic as a result of her experience. I enjoyed Food Whore quite a bit. The food admittedly get more attention than the characters, though, leaving the book just a little lacking in character development - at least where Tia's friends and acquaintances are concerned. It felt like there were hints of things going on with the supporting cast that were never truly fleshed out. I would have liked to see those stories develop just a bit further, but that might be the point. Tia's exploring a pretty selfish phase and that's part of the reason that things play out the way they do. While some readers might find Tia somewhat unlikeable as a result, I found her easy to relate to. I might not necessarily make the same decisions she did but Tom made me understand Tia's motivations and sympathize with her anyway. Food Whore is a fun debut that can (and should) be gobbled up in one sitting. You might want to have some snacks handy, though, as the food descriptions will definitely lead to cravings! For more on Jessica Tom and her work you can check out her website here. You can also like her on Facebook and follow her on Twitter, Pinterest, and Instagram. I'll be sure to have lots of fun and fancy snacks on hand!